Kalkaska County is an outdoor wonderland with abundant natural resources. With more than 80 inland lakes, 275 miles of streams and rivers, and numerous state and county parks, residents and visitors alike have nearly endless options for enjoying the natural beauty that surrounds Kalkaska. Kalkaska County’s lakes and streams lure fishermen and travelers to the village of Kalkaska. Small wonder then that a large statue of a trout dominates the downtown area. 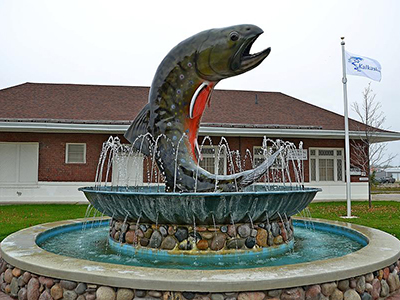 Kalkaska hosts the National Trout Festival each April. It is also the starting point for the 27.2 mile Iceman Cometh Challenge bike race each November. Kalkaska has a great school system - Kalkaska High School ranks among the best in the state for academic and curriculum performance. Other amenities include affordable housing, easy access to major state highway corridors, a county recreation complex, ball fields, and horse barns built by active equestrian clubs. Snowmobile, motocross, and horseback riding enthusiasts enjoy many marked trails that wind their way through Kalkaska County. You might not expect to see a baby grand piano inside a rural hospital in northern Michigan, but Kalkaska Memorial Health Center (KMHC) specializes in providing more than is expected. This non-profit health center serves the greater Kalkaska County region with a wide variety of care options not often found in a small community. 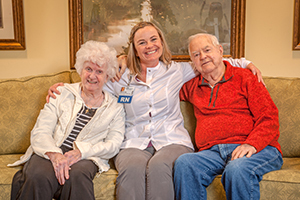 KMHC provides a complete continuum of care, from pre-hospital EMS to assisted living and long-term care. Services include outpatient surgery, cardiac and pulmonary rehabilitation, a top quality dialysis center, physician-staffed emergency department, diagnostics, nationally-accredited diabetes education, an aquatic therapy pool, sleep disorders center, primary care, and specialty care. 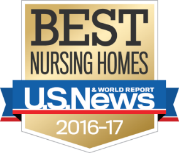 Kalkaska Memorial Health Center’s Long-term Care was named a Best Nursing Home by U.S. News & World Report. The facility also received the Governor’s Award of Excellence for quality long-term care. Kalkaska Dialysis Center was recognized in 2016 by the End Stage Renal Disease Network 11 for achieving 5-Diamond status based on best-practice standards for patient safety and care. It achieved a five-star Medicare rating in 2016 for high quality patient care.